Pra Somdej Pim preferred block press (Niyom). 'Nuea Pong Nam Man Pasom Wan Sabu Luead' (Herbal Powders with Red Blood Soap Herb). Released in 2515 BE, this is an extremely rare and lesser known edition, that is highly favored with older devotees of Luang Por Guay in Chainat, who were around at the time of the edition. 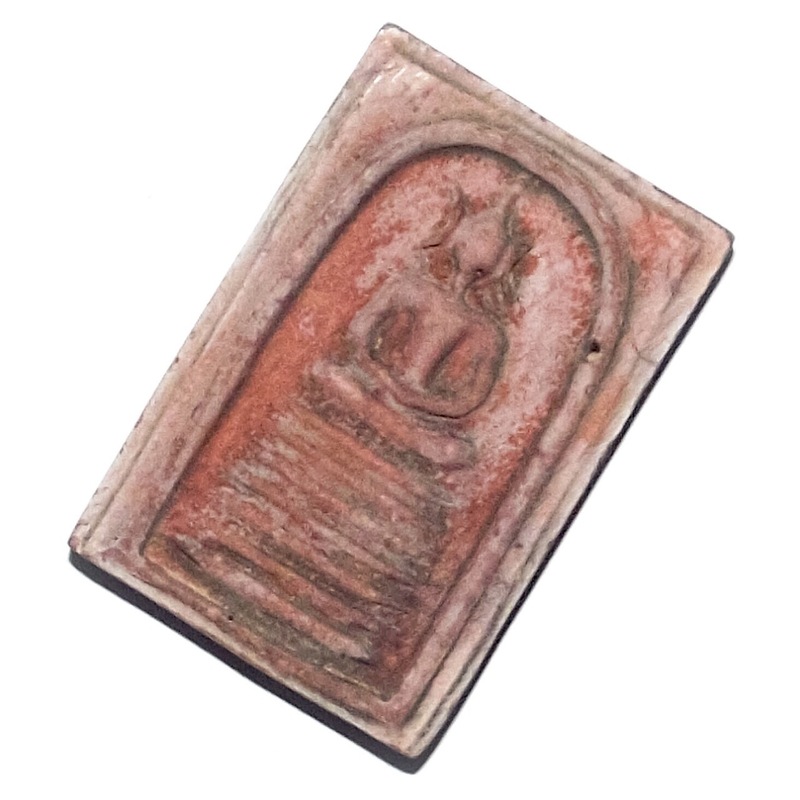 This Niyom Amulet is included in the Dtamniap (official catalog) of Pra Somdej made by Luang Por Guay and can be found in Encyclopedic works, which authenticates its existence within the Dtamra of amulets by Luang Por Guay very easily. 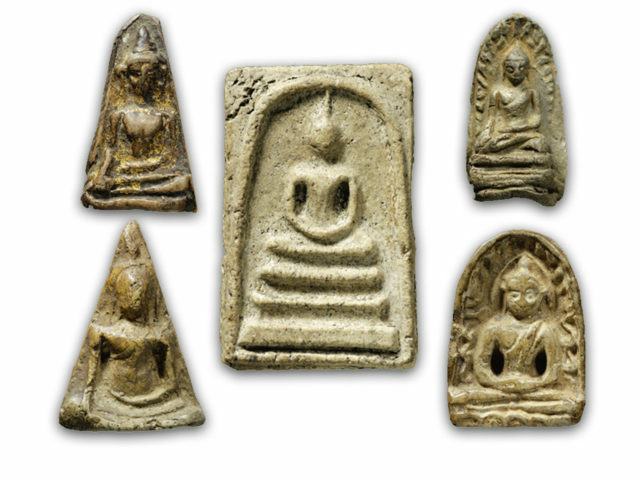 Extremely rare and highly favoured by the Devotees of Luang Por Guay, the Pra Somdej Gaes Chaiyo Pim 7 Chan features an image of the Buddha seated on a seven tiered dais, in emulation of the Pra Somdej Wat Gaes Chaiyo amulet of Somdej Pra Puttajarn (Dto) Prohmrangsri. 'Ok Grabork' (Tubular torso), with 'Hoo Bai Sri' (slanted pointed ears). 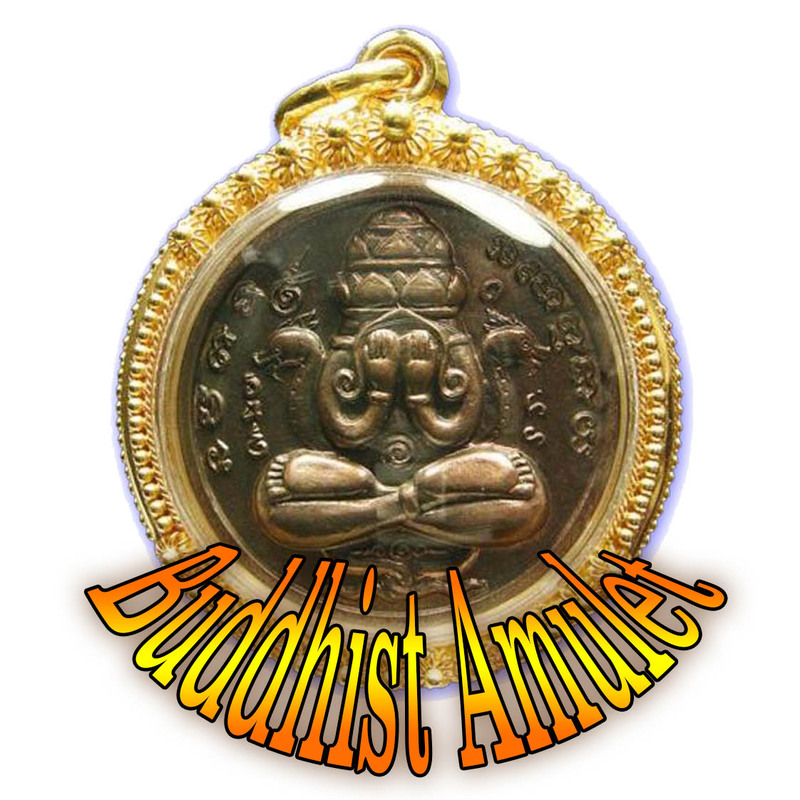 The amulet is for Prosperity, Auspicious Karma, and to Deal with all Obstacles and Evil Forces, Ghosts, Demons, Curses, and Inauspicious Karmic Effects. The Pra Somdej Gaes Xhaiyo 2515 BE series was made in various kinds of Muan Sarn sacred Powders; 1. Pong Puttakun (white), 2. Pong Nam Man (Yellow-Beige Oily texture), 3. Pong Pasom Bailan (Black Parchment Powders), and 4. Pong Wan Pasom Sabu Luead (Herbal Powders with red Blood Soap). It is the red version which is the rarest of all. The rear face shows separation of Wan Sabu Luead with the Pong Nam Man (Herbal Tang Oiled Powders), which reveals a white mildew which has risen to the surface of the amulet, and varied tonality of color, ranging from deep red, to pinkish white. 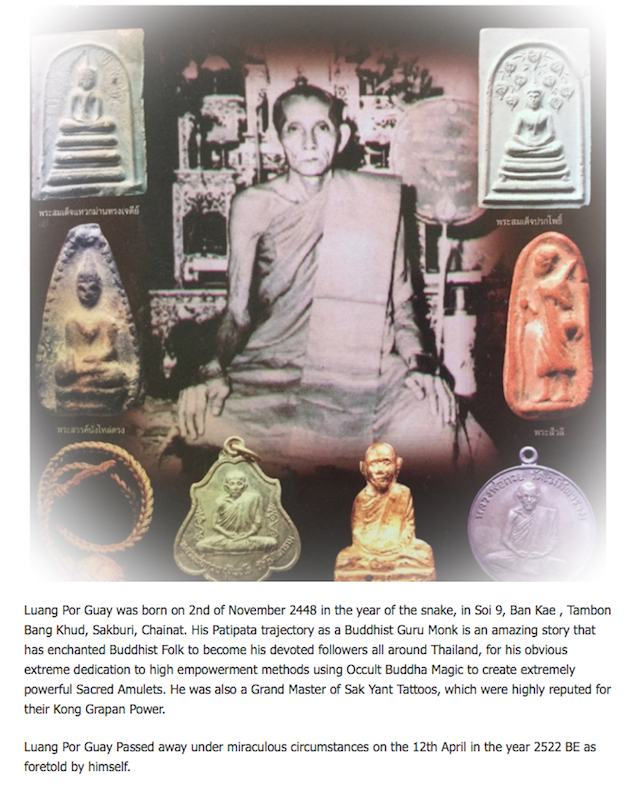 In addition, he would perform empowerments during the various 'Reuks' (Astrological Influential moments), to bring total coverage of protection and fortuitous blessings to all who might wear and Bucha his amulets, namely the 'Reuks Mongkol' Buddhist Auspicious alignments, the 'Reuks Jone' (Gangster Alignments) Inauspicious Alignments, and the 'Reuks Bun Paya Marn' Demonic Influential Alignments.